John Poole of PrimateLabs let us know that the first iPhone 5 benchmark has hit Geekbench. The results show an iPhone5,2 device running iOS 6 with a Dual-Core 1.02GHz ARMv7 processor and 1GB of RAM. The total Geekbench 2 score comes in at 1601. Poole notes that the average score for the iPhone 4S is 629 and the average score for the iPad 3 is 766. A comparison chart of previous iOS devices can be viewed at Geekbench. The numbers seem to validate Apple's claim that the A6 processor is twice as fast as the A5 and any previous iOS device. This one score also places the iPhone 5 ahead of the average scores of all Android phones on Geekbench. The full Geekbench results further breakdown processor, memory and bandwidth performance. The A6 also appears to be clocked higher than the A5 at 1GHz (the iPhone 4S A5 ran at 800Mhz). The 1GB of RAM was previously confirmed by part number markings on the A6 processor itself. Poole acknowledges that any pre-release results on Geekbench have a chance of being faked, but he seems to believe that these results are legitimate. The iPhone 5 will be available to the general public on September 21st. Two cores running @1.02 GHz each outperforming S3. Engineering people, engineering. This is all less about specs and more about engineering. All that performance from a thinner/lighter package; a testament to superb engineering and design. But...but... the S3 has better specs? So wait a second. The iPhone 5 is the thinnest, lightest, and fastest smart phone on the market with the largest App store? Srsly guys this phone was a disappointment like everyone said it was. Samsung needs to update their ad. 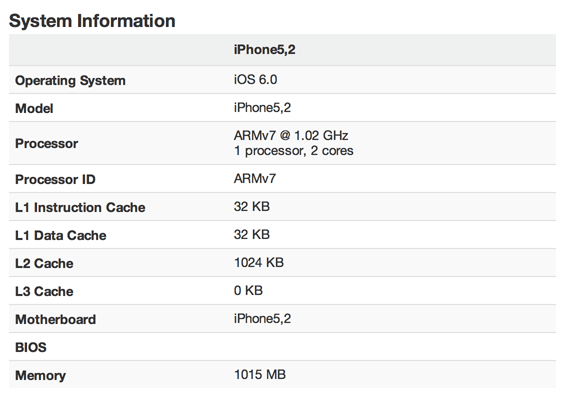 Damn, the iPhone 5 will officially be the fastest smartphone out there. And that's just theoretical performance. In practice the resource-efficiency of iOS will make this phone even more of a beast.